A highly customisable trip of 2-7 day’s duration for 1-10 people, with a mix of drift boats and/or wade fishing. You simply tell us your dates, and we do the rest. We will pick you up and drop you off from a predetermined point, and organise the fishing, accommodation and transport. You simply show up and fish. The most popular option is a weekend Friday to Sunday package where we collect you on a Friday afternoon and drop you back late on a Sunday night. However this trip can be run at any time of your choosing. We are pleased to offer our clients a new and unique service. The Guide’s Road Trip. It started out as an idea between a close knit group of friends/guides here at GVFFC who’ve fished together for the past 25 years. The concept was to offer a service that closely resembles our own personal fishing trips. That is, hit the open road with rods, cameras, guitars and drift boats; and fish whatever we find along the way. From all those late night discussions around the campfire, in airports, and on drift boats; came the ‘The Guide’s Road Trip’. 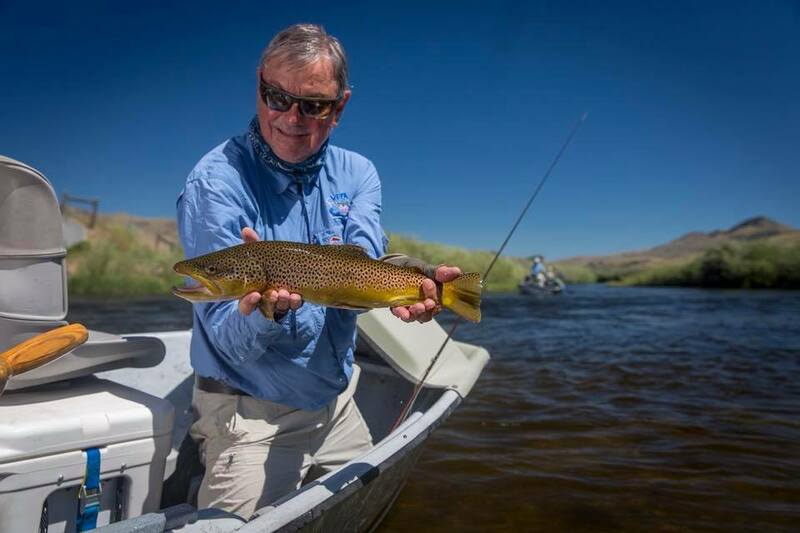 Hamish with a lovely fish taken on our most recent ‘Guide’s Road Trip; a ten day foray across Wyoming, Idaho and Montana. A 2-7 day trip including a mixture of wade/drift boat on offer. Meals = we will provide continental breakfasts and light lunches, the latter consisting of of basic healthy sandwiches, sweets, fruit. We will have plenty of drinking water and tea/coffee with us. Dinners are a case of pay your own way. All transport included – we pick you up and drop you off at at a pre-arranged point. Trips are led by Antony, Bo, John, Lachie, David or Geoff. Minimum of one angler and one guide. Guide : Client ratio no greater than 1:2 Most trips will be 2 – 4 anglers but we can cater up to 10 if you have a larger group. There are set dates listed below for the six day version of the trip, but this trip can be run at anytime/on demand and even for single anglers. We will collect you from a predetermined point and then hit the road armed with the latest information from our friends at Ballarat, Bright, Cooma, Eskdale, Jindabyne, Khancoban and Tumut. With the drift boats we will be able to fish all of the premier tailwater rivers (i.e. Goulburn, Mitta Mitta, Swampy Plain, Tumut), as well as any of the lakes that we pass along the way. Nothing is off limits, and there are no set fishing times each day. We can drift through the day, have dinner and then hit a nearby lake to chase mudeye feeders after dark. Or even do multiple sessions in a day. We can also wade fish the smaller streams for those that want to mix it up a bit. There are no set rules on what we do and where we go, and having both 4WD’s and drift boats, we can fish pretty much anywhere within a six hour drive of Melbourne. Accommodation will be sourced along the way and will take the form of clean, comfortable twin-share motel or similar. All breakfasts (continental) and lunches (sandwiches/fruit/water) will be provided, with the only extra out of pocket expenses being dinner, alcohol and fishing licenses. We will provide you with some of our most experienced guides, a drift boat per pair, all flies, all transport; as well as the use of any gear, if required. The opportunity to camp out in the wilderness/on the river may also present itself (only for those who request this), in which case we will supply you with all the necessary gear; including the finest tents and sleeping mats. While there are a few set trip dates listed below, the trips can be run at any time. While this trip was devised around groups of four or larger, we can also run them for 1-2 anglers with one guide; or larger groups of up to ten anglers. This trip will ensure that you make the most of your precious time away from work and/or family. While you could lock into one specific area and hope that the fishing is good at the time that you’ll be there, the Guide’s Road Trip format allows you to guarantee the best opportunities for any set period of time that you have. 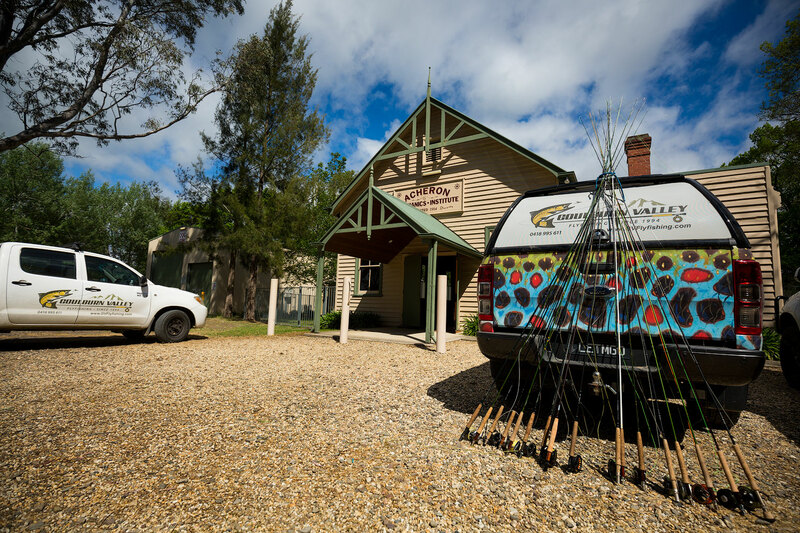 Being able to move at will and having access to quality reports from our friends across the VIC/NSW, we simply go to wherever the fishing is best at the time. Not only that, but we don’t stick to any set hours on these trips. If that means two sessions in a day, or staying out late or starting early, we are up for it. We realise that you may not be able to sneak away from work as often as you’d like, and so we treat this trip like we treat our own personal fishing trips, and we give you the maximum time on the water. Please phone us on 03 5773 2513 or 0418 995 611 to learn more. Prices on application. The dates listed are traditionally among the best times to fish in Victoria. Late spring and early summer, particularly the lead up Christmas when the fishing is often very good and the rivers are uncrowded, is our favourite time. Mid-Autumn is also excellent with perfect temperatures and fish eagerly feeding before as winter draws near. Most of the fishing is dry fly based. We will run this trip at any time that suits you, so please phone us on 03 5773 2513 or 0418 995 611 to discuss the options. Feel free to run any ideas past us. We are here from 8am-10pm, every day of the week.